Moderate eruption of acne, being the minimally inflammatory type of pimples, could cause scarring in some affected individuals. This calls for early consultation with a dermatologist to get rid of the acne at the earliest stage itself. 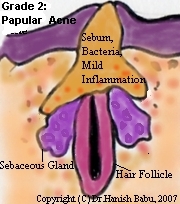 Acne is divided into different types. Moderate acne comprises of skin colored bumps (papules) predominant acne eruption. Some comedones and pustules (pus filled bumps) are also present. When the number of comedones are higher than 20, even without the presence of papules or pustules, it may be considered as moderate grade 2 acne. In a nutshell, 20-100 comedones and/or 15-50 inflamed papules or pustules with a total count of 30-125 acne bumps comprise moderate acne. How Does Moderate Acne Develop? The events of acne formation start with the increased production of androgen hormones. These stimulate the sebaceous glands to produce more sebum and also produce changes in the lining of the hair and sebaceous ducts. Keratinous plugs are formed in the opening of the hair follicle, the open and closed comedones. When the normal resident bacteria of the hair follicle, known as Propionibacterium acne, start multiplying within the oily sebum and produce irritant side products, this triggers an inflammatory response within the hair follicle and sebaceous glands. When the inflammation is minimal and contained within, the sebum and the products of the inflammation accumulate within the hair duct, raising the surface of the skin, forming skin colored or slightly reddish bumps. When the inflammation is significant, these results in formation of pus, which is actually the debris formed from the inflammatory cells, dead and damaged cells and living and dead bacteria. Thus are formed pustules, the other type of lesions seen in moderate acne, albeit in a limited number. What are the Triggers for Moderate Acne? The acne triggers inducing, exacerbating and maintaining moderate acne is similar to all other types of acne. What are the Complications of Moderate Acne? As with other inflammatory acne, there are chances of scar formation in untreated moderate acne patients. Though it is not possible to predict who will get scarring, a family history of scarring and predominance of papules and pustules should alert the acne sufferer to seek early treatment. While healing, post inflammatory pigmentation (dark spots) may occur in some patients, especially those with dark skin. Anxiety and depression may affect the individual from fear of disfigurement from the pimples. What is the Best Treatment for Moderate Acne? The best treatment of moderate acne is a combination of topical retinoids (isotretinoin, tretinoin, adapalene) and antibacterials, along with oral antibiotics when inflamed bumps are present. Being the transition state between non-inflammatory and inflammatory types of acne, it is imperative for moderate acne be treated early so as to avoid the complications of scarring and progression to severe type of acne.